Champion Hills: Mountain views, great golf and good friends. 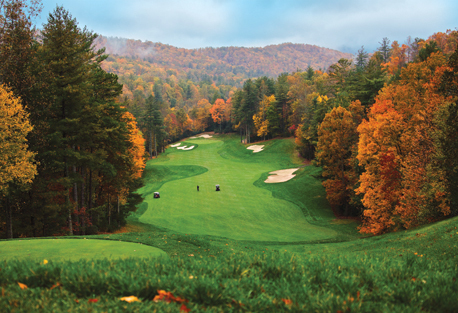 When asked why they chose to live where they live, people often jump at the chance, especially when they live in the luxury golf community of Champion Hills in Hendersonville, NC. Thus, it’s worth taking a minute to screen two short videos (see link below) in which two families share their personal feelings for the community. Todd and Julie Headley from Washington, D.C., explain that their first visit to Champion Hills told them it was the Western North Carolina area they had been seeking. Send me more information about Champion Hills! Spectacular views are standard on the Tom Fazio mountain course. For Tom and Patricia Van Laar, what stood out was the realization that residents of the community “had lived very interesting lives,” and came from “all parts of the U.S. and all parts of the world,” as Patricia puts it. The Van Laars themselves had lived in a number of places in the States as well as in Europe. Send me more information about Champion Hills! Homes are high quality and feature modern design and features. They owned a home in Hilton Head, but wanted a second place in the mountains. Tom and Patricia visited a number of communities, but knew when they came to Champion Hills they had found something unique. See what else they had to say about living at Champion Hills by clicking this link.